This rifle is indeed one of the three major models of target rifles made by Edwin Wesson, who was the oldest of Rufus Wesson's sons. Although bullet starters are not exactly false muzzles, they are an important part of the weapon, that can probably never be replaced if lost. False muzzles were invented in 1840 by Alvan Clark of Boston, who assigned sole rights of its use to Edwin Wesson, who licensed other makers in 1848. Since they were made integral with the barrel and cut away after rifling, false muzzles fit perfectly to only one barrel, and can therefore not be replaced if lost, because any replacement will always show tiny differences in the rifling. Bullet starters are not rifled and can therefore -theorically - be replaced. 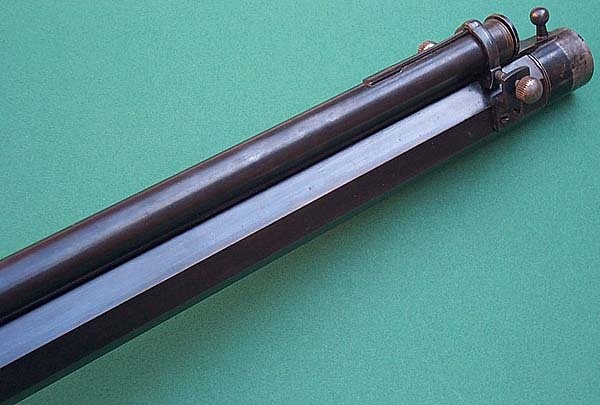 Both devices were designed to prevent wear and damage to the most important part of muzzleloaders on the field of accuracy: the very end of the muzzle. Most part of the wear would be taken by the false muzzle or the starter, that had of course to be removed after loading and before firing the gun. Bullet starters help to place conical bullets properly and to introduce them in the barrel without damage, prior to ramming home. Edwin Wesson opened his first shop in 1831 at Grafton, Mass, where he specialized in hunting, target and sporting percussion rifles. His rifles became soon renowned as the best quality target percussion rifles in the world, with a quality grade and finish that were far superior to any other competitive product. He moved his shop to Northboro, Mass. in 1842, where it stayed until 1848. That year it was moved to Hartford, Conn. Edwin Wesson died in January, 1849. From an historical point of view, the Nothboro period is very important to any student of the later Smith & Wesson history. In this period, Daniel B Wesson finished his apprenticeship at his oldest brother's shop and was taught the methods of producing those high quality rifles. 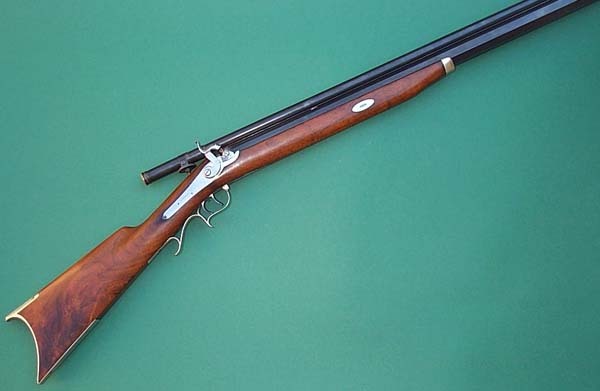 DB Wesson was a quick learner and was also very interested in the James Hunt and Jennings repeaters, that would eventually give birth to the Volcanic pistols, the later Henry rifle and, finally, the famous Winchester arms. In 1845, considering Daniel had acquired enough skills, Edwin left him in charge of the shop. In June, 1846, the Wesson Rifle Co ordered 100 revolvers from Allen & Thurber to accompany an order of rifles destined to an expedition to California. Although there is no documentary proof, it is highly probable that DB Wesson visited the A&T shop where Horace Smith was employed, and that both men met for the first time in that period. No doubt H. Smith was also an admirer of the quality of the Wesson rifles. In December of the same year, DB Wesson was also contacted by Samuel Colt and Samuel Walker, who knew of the fine quality of the Wesson rifles. Colt provided Wesson with a sample of his new Walker revolver and asked him to manufacture 1.000 barrels and conical bullet moulds for this revolver. 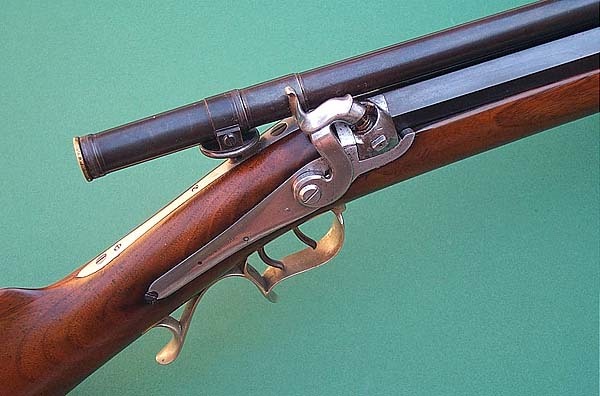 In January, 1847, Captain Walker also ordered one of the fine Wesson rifles in .44 cal (50 balls/pound) and promised a contract for 1.000 of these rifles, but that contract never materialized. In 1848, while DB Wesson was intensively busy with the percussion rifle, his brother Edwin created a new revolver, based on an 1837 patent granted to his friend Daniel Leavitt. This dragoon-size revolver was marked Wesson & Leavitt. It was rejected by the army and only about 850 were manufactured; but that is another long story. Edwin Wesson's target and sporting percussion rifles are now among the rarest and most desirable American-made percussion muzzleloaders. Although it is always difficult to estimate a value on basis of a photograph, I wouldn't be surprised to hear about high 4 or even 5-digits evaluation. 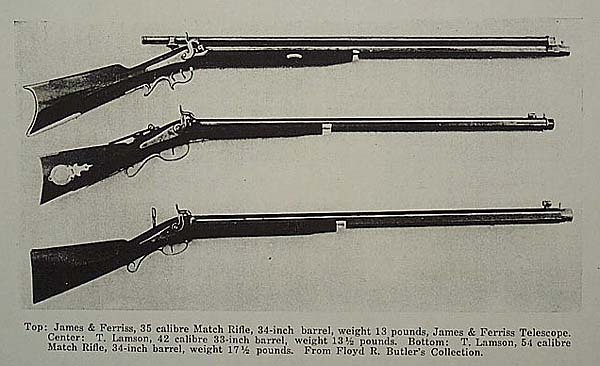 Unfortunately, those fine rifles do not appear in the Flayderman's Guide, maybe just because of their rarity. The bullet starter is the part of the device with the brass handle. As a matter of fact, it is a small rammer that pushes the ball into the barrel through the false muzzle. 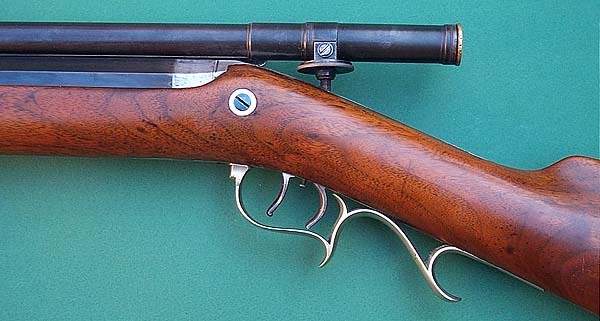 The false muzzle itself is the ring with four cast steel pins that fit into the corresponding holes at the end of the barrel. That part is the one that cannot be replaced if lost. The lateral pin on the upper side was meant to help the shooter not to forget to remove the device after loading. Since it came in line with the scope, that pin would prevent aiming if the false muzzle was not removed. Percussion sharpshooter rifle - muzzle loader cap lock rifle by E. Wesson/Massachusetts, about 1839-49. Heavy and originally rifled and blued eight edged barrel cal. 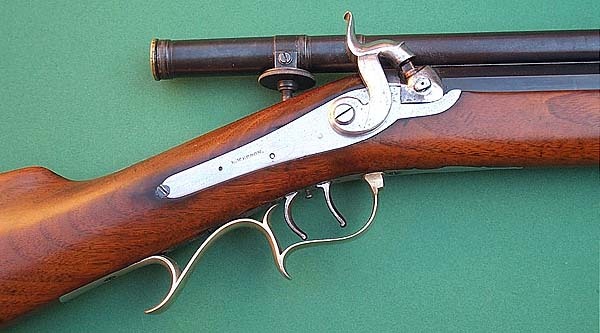 10mm with long original telescopic sight and back lying lock. Lock plate signed ".WESSON" for Edwin Wesson who has been working at the same time in Grafton and Northboro. Literature: Exactly this weapon is shown in "Muzzle Loading Cap Lock Rifle by Ned H. Roberts page 265 and 266. Harold L. Paeterson, The Book of the Gun, 1962, page 151. On top of the barrel signature "JAMES & FERRISS UTICA". Light trigger, half stock of American walnut wood with German silver mounts. Total length without phoney muzzle 123cm. Many thanks to "ARSENAL.DE" for the pictures.